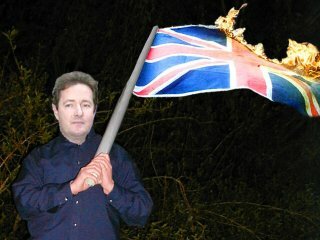 Random Perspective has gained shocking images of Daily Mirror editor Piers Morgan burning the Union Flag in his back garden late at night. Despite many inconsistencies in the photograph, such as the rough edges around Mr Morgan’s head, the difference in tone of his hands to his face and the obvious airbrush work done to the flag handle our source insists the photograph is real and refuses to accept claims it is an elaborate hoax. Random Perspective Editor Ben Dickson has pointed out that whilst the photograph of Mr Morgan could cause minor damage to his reputation if they are proved to be fake, the photographs of the British Officers assaulting Iraqi POWs will irreparably damage the reputation of the British Army across the globe regardless of whether they are real or not.